Because you all loved the first instalment of Chilli Gold slots play, we hope you’ve got the fire in your belly for a second. The hotter the chilli the greater the reward, put your money where your mouth is with our slots on this invigorating 40 payline. Spicy! After the success of the original, Lightning Box now bring you the sequel – Chilli Gold II. The moustaches and sombreros are back, as is the Mexican music which adds to the authenticity of the game. This is a fast-paced fun game that will have you coming back for more! The maker of this game is called Lightning Box. While not one of the biggest, well-known games providers out there, Lightning Box have certainly found a winning formula with this game. The cartoon style and fun nature are very appealing and this has been coupled with generous bonus content and jackpots. As a follow up to Chilli Gold, mark II of the game definitely doesn’t disappoint. 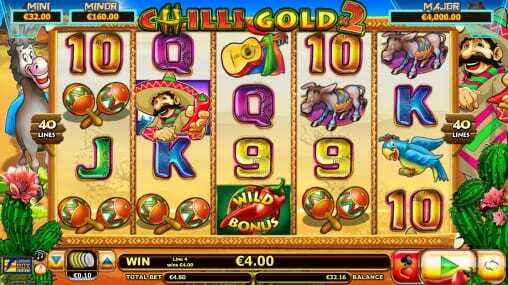 If you want a taste of Mexican online slots games then this is for you. Functionality-wise, we have a whopping 40 paylines generated from the 5 reels and 4 rows. One fairly unique feature is that you can win up to a 1000x multiple on your original bet. Furthermore, the game lends itself well to the ever more common mobile phone gamer. 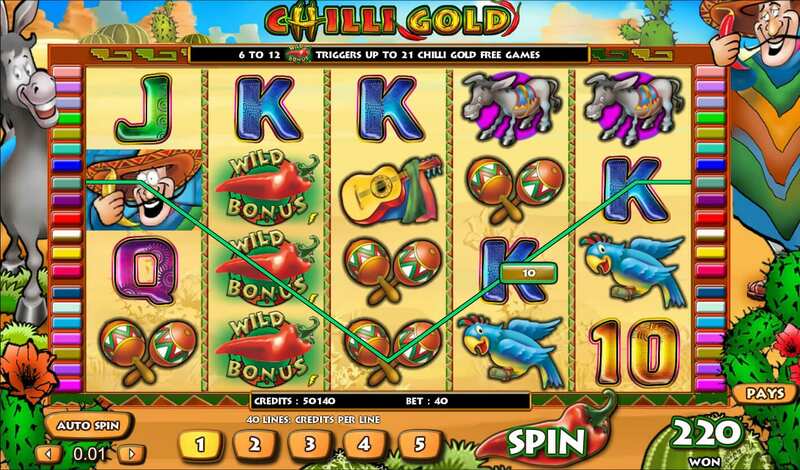 As well as the cheeky Mexican man, we also have donkeys, parrots and chilli peppers make it the best slots for Mexican lovers! In the background, we see the Mexican desert landscape and the stereotypical cactus plants. The combination certainly does provide a sense of charm and cheekiness. There are some slightly unusual betting options with a seemingly random minimum bet amount of £0.48. You can, however, stake up to £60 if you’re serious about your slots! The gameplay is fairly simple and user-friendly, as well as the characters we have the usual numbers and letters for the rest of the symbols. A new player with slots will definitely feel welcomed by this game. The bonus features are nice too and they will keep you on your toes! The red chilli pepper acts as the wild symbol and this will tap-in for most the other symbols to increase your chances of winning. 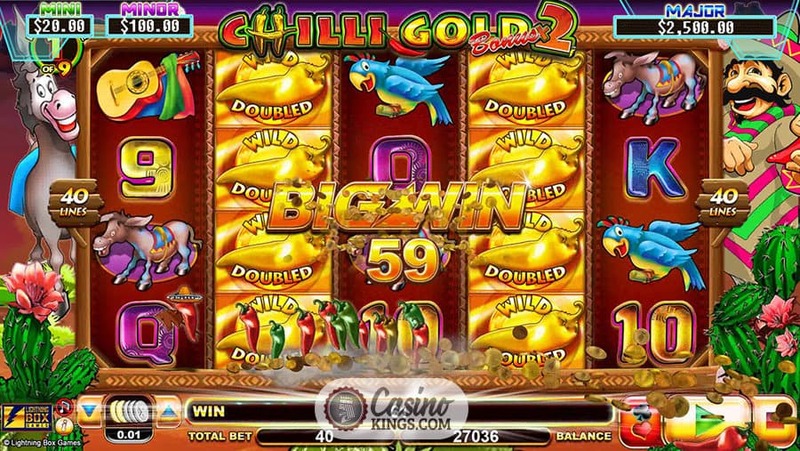 If you manage to land the chilli on reels 2 through to 4 you will generate a multitude of free spins, up to a maximum of 21. There is also an enticing “gamble” option which allows you to double up on your latest win, or even quadruple it! To do this you need to correctly pick the right colour and suit of a playing card drawn at random. Remember though, there is a certain element of risk attached to this feature as you might lose your win! We like the quirkiness of this slot and it has proved very popular among the gaming community. The gamble feature adds an extra bit of thrill (and risk) so use it responsibly in order to keep having fun! If you like this game then why not also try Enchanted Prince.